The Easter holidays are upon us again, and the usual Waddell, McGivern, D’Alessio get together is once more upon us. 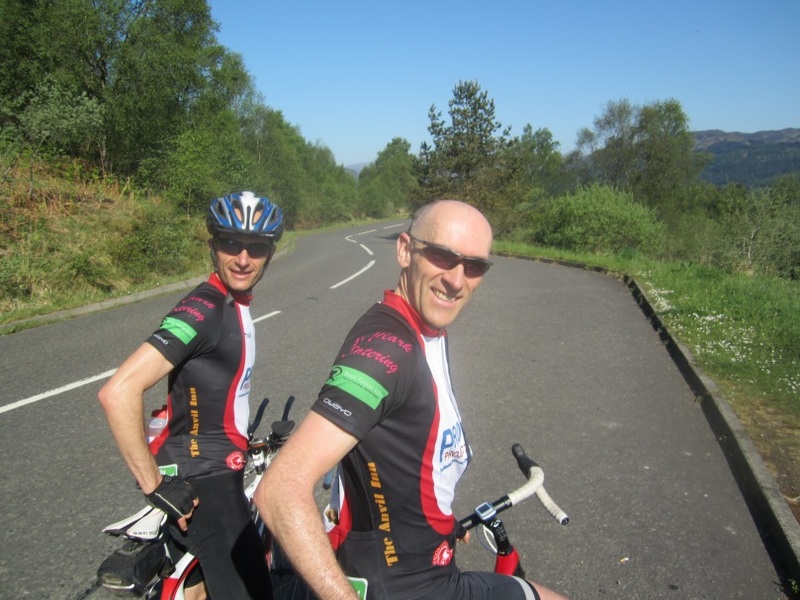 From Huntly to Mull to Fort William and this time down in the borders – Langholm to be exact. Never been here before, but I’m sure it will be lovely. So not time to cycle. Not quite. Gio hatched a plan and it’s me and him on the early morning train to Berwick with a vague route plotted to take us to Langholm. Starting out from Berwick we hook up almost immediately with a local, just as we are contemplating a none too road bike friendly section of cycle path. Our new friend, Alistair, ensures us it’s fine and just a quick means of crossing the A7, so on we go – and he’s right, it’s fine. 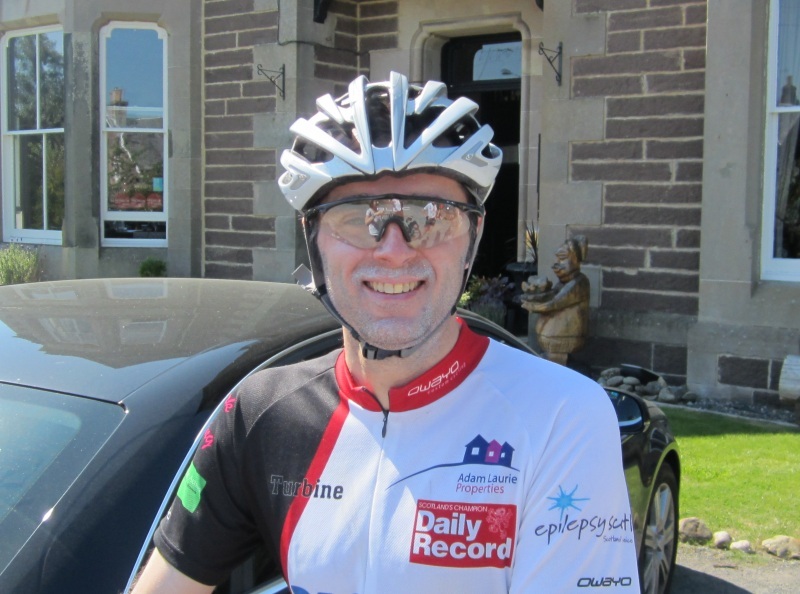 Alistair sticks with us for 22 miles to Kelso. He’s good company and knows the roads well, so the miles pass by quickly, aided by the tail wind. No big pushing going on here, but a healthy enough average, and very little in the way of hills until we part company in Kelso. We continue on at a reasonable rate with the road beginning to rise and fall, and repeat. It’s all good as the roads down here are cracking and the traffic almost nil. Riding in the borders really is heavenly. No mishaps, no big setbacks, no major incidents. And from my viewpoint, no big memories of much of the route. Suffice to say we end up in Newcastleton, anticipating 5 miles to journey’s end. Hmmm. 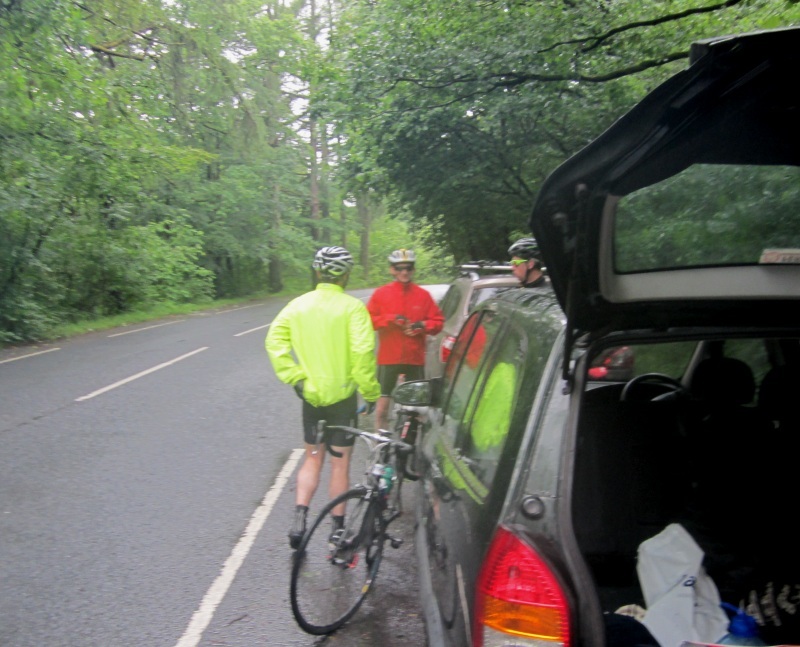 We speak to a chap watching a game of football who tells us that we can continue on the flat road we are on and will hit Langholm in 15 miles, riding the A7. Not a comforting prospect. Or we can go in another direction (our intended route) which will be quiet and is 9 miles – “it’s hilly mind you”. He lied not. The road went sharply up, then went up and up and up. Down a bit and then up and up. Getting ridiculous now. Eventually, it went way down and we were flying into Langholm, at which point we recalled climbing this very hill the other way round in a sportive last year – Never been here before. Incorrect. Nearly done now. As ever, there is always a sting in the tail. We hoped to have maybe a half a mile to roll to the holiday home. In truth, still 7 to go and a couple of right good hills. However, it’s not long until we pull up in front of the beautiful dwellings that shall constitute home for the next week. A quick For Goodness Shake, a bit of Sandra’s diving malteser cake (or 3), and pull the shutter down on a fantastic 96 mile training run. Life is sweet. Sunday’s training run – the Duke’s, Kippen and Crow Road hills – a tough 60 miler, and now a favourite route of the team was on the table. Gio, John and myself were the riders, with the rest out for various reasons. We set off, the roads drying out and the clouds clearing away, looking to give us a decent day for the ride. Section one (stealing Big J’s breakdown of the route), a nice section of rolling road to Aberfoyle, allowed me to get some good practice at group riding, taking turns at the front and resulting in a nice average speed of 18.7mph. I found myself falling off the back a bit if I took a swig of juice after my turn at the front, must work on the process of pedalling and drinking, but easily regained the group at this early stage of the ride. We soon had our first hill ahead of us, at the ~16 miles mark, the Duke’s pass (section 2). 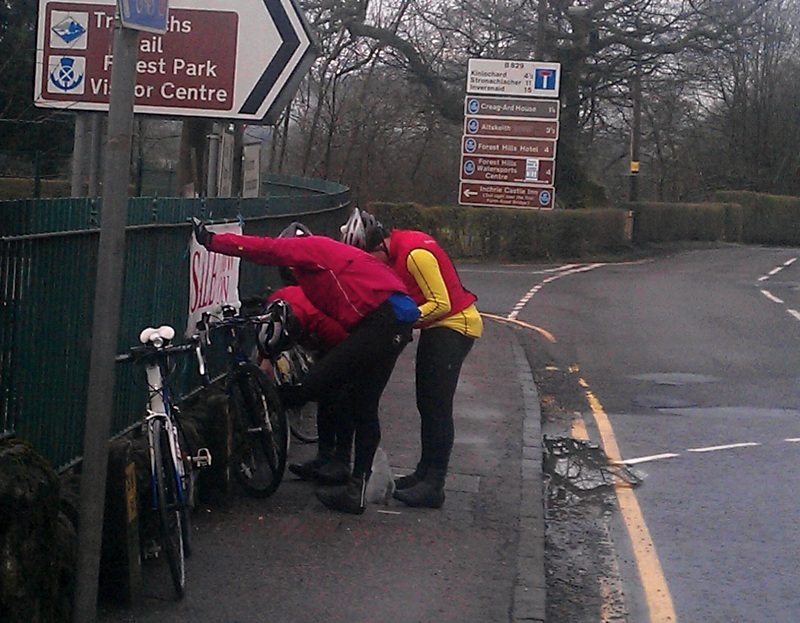 A brief stop to refuel, and I set off ahead of the others, knowing they’d soon overhaul me. Determined to take this hill without falling below 6mph (speedy! ), started steadily, trying to avoid dropping into my lowest gear, standing on the pedals at the steeper parts of the climb. The hardest parts of the hill still are still challenging, but at this point, have lost their full thigh-burner status as my ability to cycle and understanding of the gears have improved. Result – 7.95mph. Not brilliant, but pleased that I easily topped my 6mph target. Section 3, rolling roads again and more group riding. Odd incident on the road (all the fun happens when I’m in the group it seems), as at one point we’re hot on the tail of an elderly driver in an A6 and we’re having to brake to avoid running in to them! Much confusion and merriment from us, but eventually the driver works out the pedal on the right makes you go quicker and we’re left behind, no longer sucking in their fumes. This section saw us averaging around 18.8mph. Consistent stuff. We were soon hitting the 40 mile mark, the second hill of the morning at Kippen, and as usual, the others leave me on the first rise of the climb. I settled in to my own rhythm, enjoying the scenery and having mixed feelings towards the sunshine (nice for view, not so much for sweatyness). Its not long before two ‘pro’ cyclists zip by me, not muttering a word in response to my greeting as they tear up the hill, I guess saving their breath for whatever private competition they are in. Not much further on, another cyclist, sharing the previous pair’s team colours breezes by me, this time with a hearty hello. As I crest the final rise he’s not far off, so I clunk up the gears in a (futile) attempt to catch him – another short hill puts paid to my chase but shortly after I do catch them, as they’ve all stopped to regroup with another handful of their buddies. Average up the hill – 8.3mph. Not so bad. I press on, as John and Gio are not to be seen (no stopping at the top this time) and enjoy the downhill section solo. Well, up to the point some (hmm, family audience), so lets say “bad driver” in a Range Rover thinks driving up my backside and beeping me when there’s bags of room on the other side of the road to overtake (no other traffic for miles) is the correct etiquette. Must look that up in the Highway Code as I must have skipped that part. 13 miles to go. Shame there's a nasty big hill in the way. Fintry. Chow stop. J&G already out of sight. 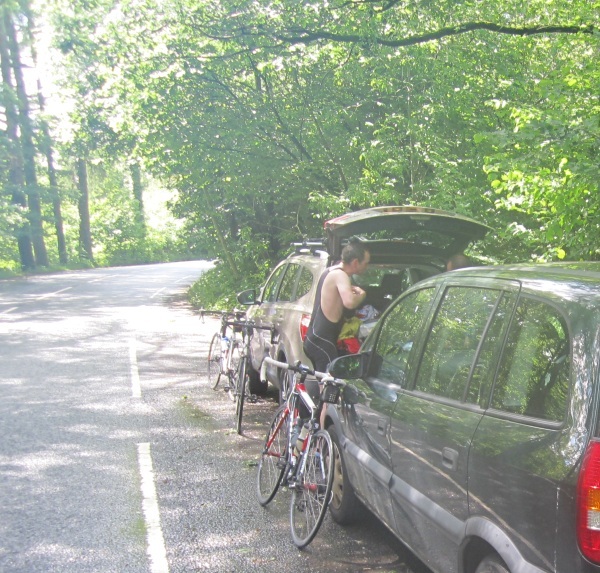 We regroup around Fintry, John and Gio wanting to hammer on to the Crow (aka section 5). I’m happy to let them go, and chow down on a Torq bar (ginger and pineapple flavour – who came up with that one?) and a gel before heading along solo to the 3 mile climb before me. I settle in to a I’m-pretty-knackered-don’t-care-how-fast-this-is pace (turns out to be 7.6mph average) as I’m hitting the limit of my current fitness and ability. As I climb slowly, a handul of riders come down the hill (oh how I detest their ability to freewheel at this point in the day) with a cheery nod, wave or ‘hello’ to which I attempt a similar greeting, its success dependent on how steep the hill is at that point. As I reach the ‘house’ on the hill, the weather decides that it would make my cycle oh so much more fun if it were to hail. How nice, tiny ice particles pinging off my face just to cheer me along. 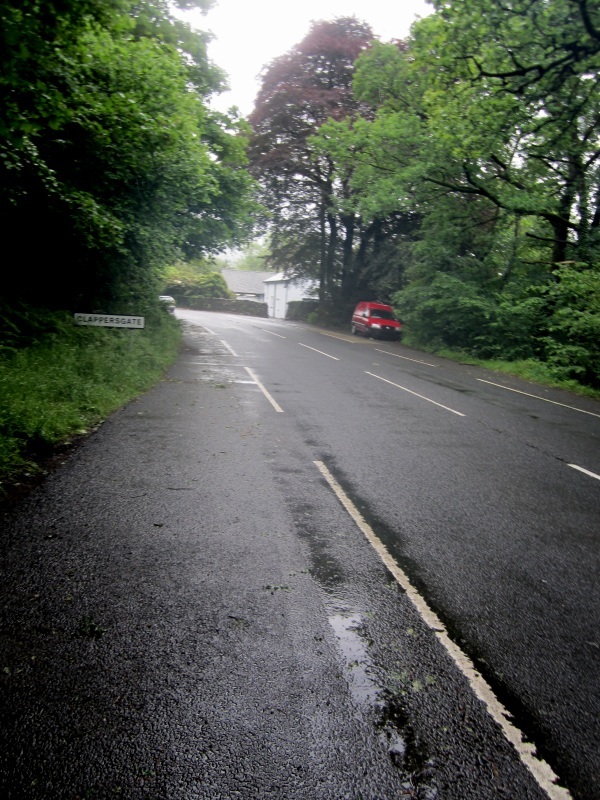 The hail stops as I crest the hill, and I clunk the gears into a more suitable ratio for the downhill section. More hail. 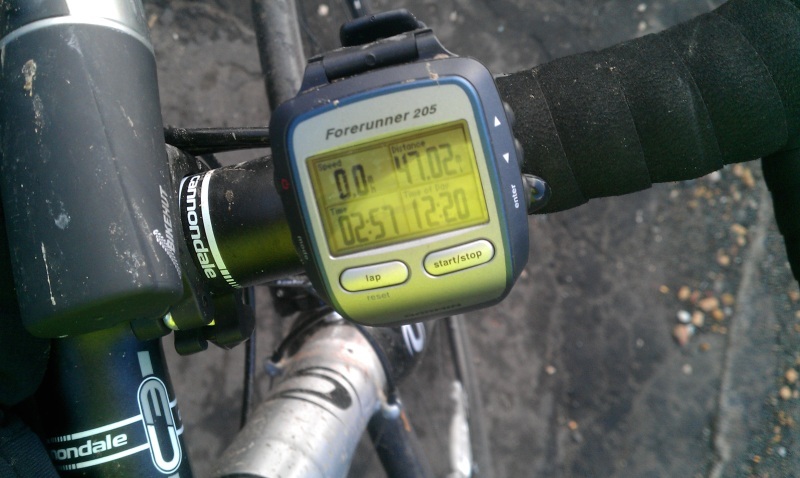 The faster I go, the more it hurts, so I ease off the pedals until it subsides moments later. Top speed on the downhill, 33mph. Could have been quicker, but I’m shattered and don’t have the energy or confidence to risk much faster. Another Sunday, another LEJOG training run. Not such a big turnout this time, but four of this summer’s seven riders made the early 8.15 am start (Brian, Gio, John and myself), and were joined by a friend & colleague of Gio’s, Stuart (or is it Stewart? ); though Sammy turned up in person to give his apologies. 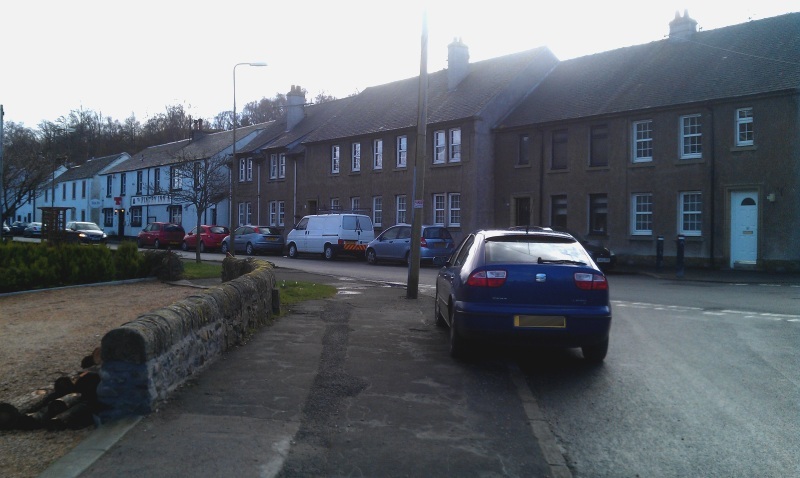 We set off from Strathblane at a solid pace, but had barely got going before we hit our first hitch – Brian’s cleat on his left shoe was just not engaging in the pedal properly. A bit of faffing around didn’t completely fix the problem, but his decision was to go on. We soon got into a good rhythm, with each rider taking their 0.5 mile or so leading the train over a good 15 mile stretch. 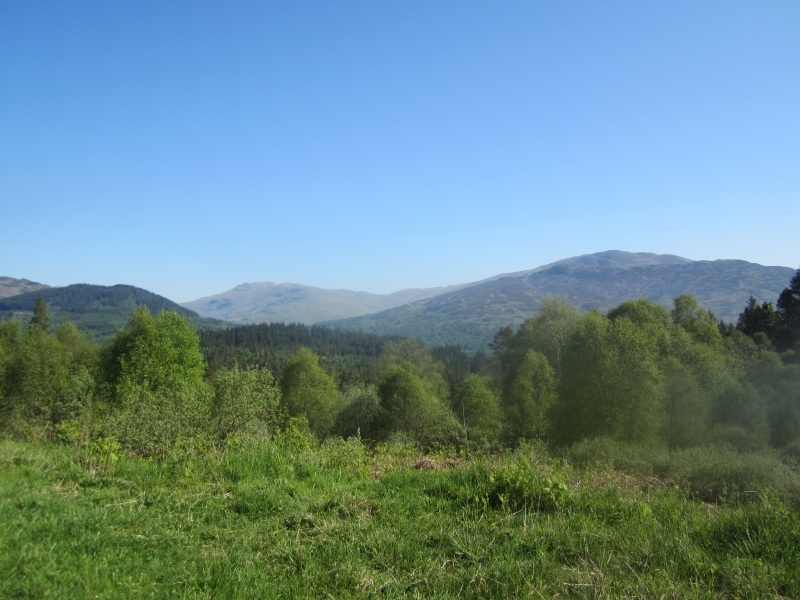 We reached Aberfoyle and our first hill of the day, comfortably under the hour – the Duke’s Pass – a new hill for me, and a new challenge. I took it slow, tucking in behind Stu and Brian as I got a feel for the slope. As the climb continued, Stu slipped back and the two of us chatted about running, work and my cycling experience (or lack of!) . The gradient was not so bad, no real thigh-burning sections, and we made the summit without too much effort, though Brian, just ahead of us most of the way up, was still having a bit of bother with that left cleat. A quick respite at the top, with a waiting Gio & John, then a nice downward stretch skirting round Loch Achray. Well, nice except for the tourist filled bus that came at me round a blind bend – in the middle of my side of the road, half-way down the hill. My brakes worked well, so collision avoided. Stuck an ice pack (good old Birdseye frozen peas) on knee at home, and hoping it goes away with a couple of days rest. Seems ok today, but will give it until Wed to ‘test’ it on a run. Team Training 3 – Where are You? 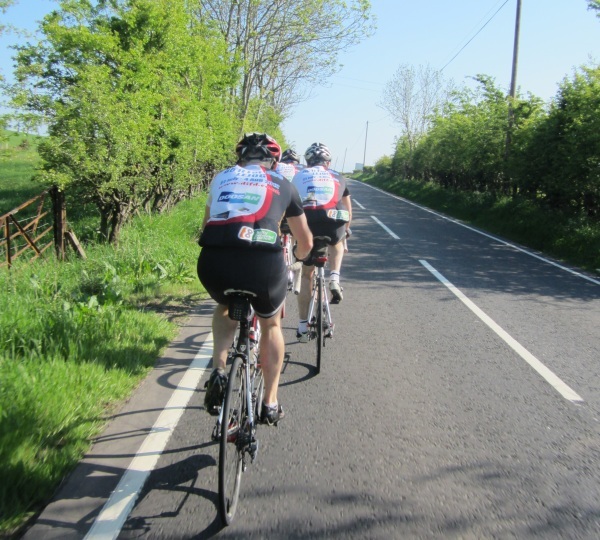 LEJOG plans are slowly taking shape – transport in the bag, team kit chosen, sponsorships plans opportunities opening up, initial accommodation booked. So how goes the team training? Hmmm. 2 of us out this weekend – me and Gio. 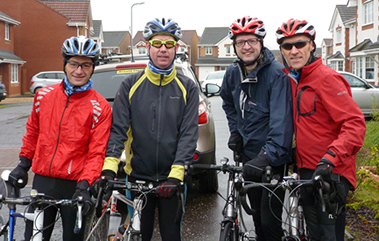 Sammy and Tubs skiing (separately) abroad, Ian visiting friends in Anstruther, Mark hopefully into his solo secret training, and there’s David (fair play to him he did cycle from Edinburgh to Uddingston again). 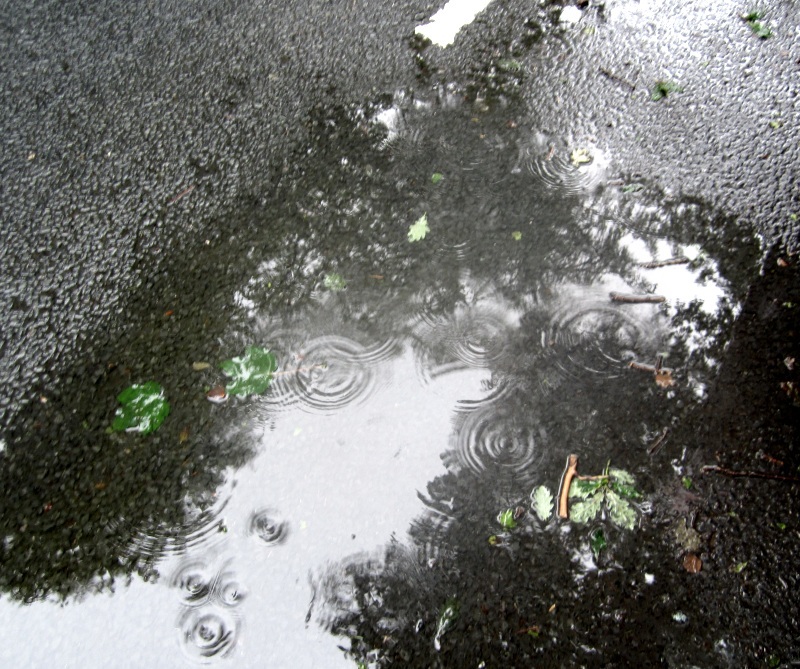 The weather on Saturday was honking – a howling gale and the rain lashing down – and bitterly cold. So we concocted a strange little routine. 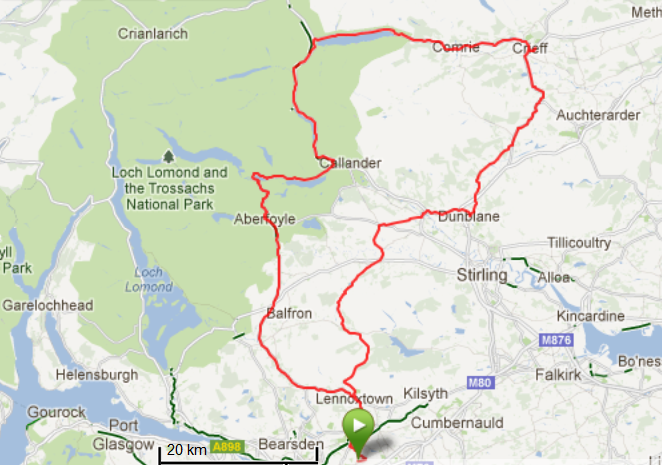 Head from Bishopbriggs to Lennoxtown and head up and over and down the Crow Road. Then turn back and up and over and down the Crow Road. And finally, up to the top of the Crow and turn round and back down – just too cold and horribly windy to to go down to Fintry and back up again. So a good day in the bag working with adverse conditions, and a nice little spurt after the final descent when a fellow cyclist had the audacity to go past us (we’d passed him earlier) – a target. He blasted along, and we sat with him and got the heat in the bones again. Very nice. And so to Sunday. Me and Gio again. A recovery ride suggested by Gio, but the day looked so nice (apart from a fair old wind again) that the shout went out – let’s do the Tak and the Crow. No ride can be described as a recovery with the Tak a part of it. Another good day, with the pair of us working well together, crawling along the Carron Valley into the wind and keeping it tidy up the Crow – again. Good miles in the bag. Roll on next week. And a bigger team? 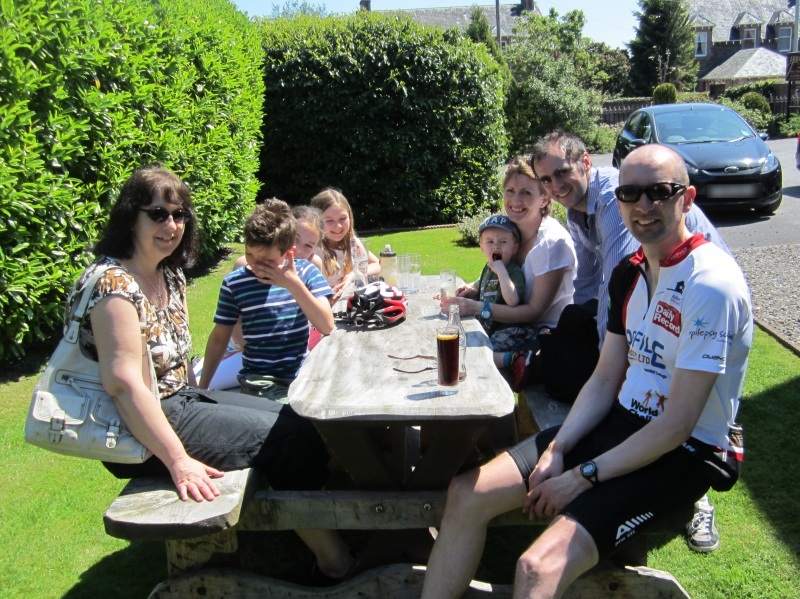 Nice to read Ian’s take on Saturday’s ride. He’s a grand lad is the big guy and will make a great rider – but he’ll need a wee bitty of time…. The route was put together by the chief route organiser Sammy. 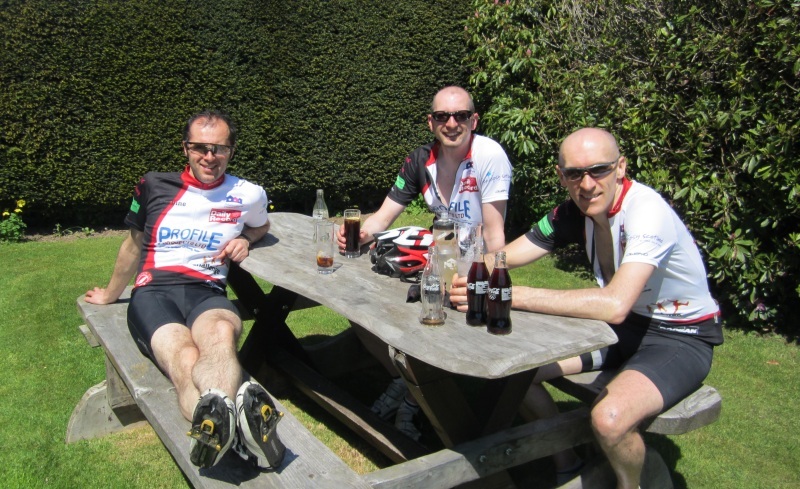 Me, him, Gio and Ian ( Mark’s not coming back out with us until he gets fitter – and he doesn’t like the way we ride). Let’s get a bit of mileage in, but not too strenuous in terms of hills – in other words, no Tak, the hill by which we judge all other hills (cycling in Nice last year the rule still held true – how does the Col de la Madone [Lance’s hill] measure up against the Tak)? If there’s no Tak, there’s got to be the Crow. Ian’s first time up from this direction (and only his second time up at all). We met the hill early on in the ride, and he did not make the mistake he did last time, which was to strain like a maniac (up the Tak) beside the others, and die a slow death for the rest of the ride. Anyway, we headed on keeping it together on the flat and stretching out a bit on the hills. All seemed well with the big fella up to Drymen and another wee hill. 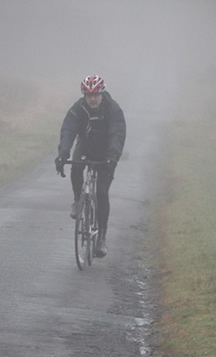 G and myself battered on into the mist along with Sammy who stopped to ‘enjoy’ nature and take a couple of snaps. Up and over the hill and down the other side to wait for Ian. He duly arrived, but the end was nigh. "Is that a busted baw blowing along the road"? 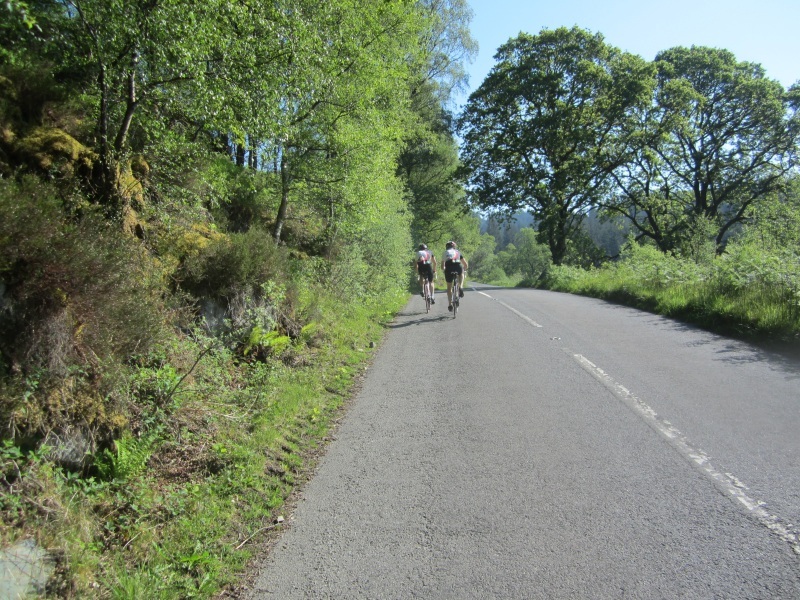 We headed towards Strathblane and I fell behind a clearly toiling Ian. By now his legs could hardly move, but still he insists on pushing a way too heavy gear. “My legs just spin without going anywhere on the lower gears”. Half right – he wasn’t going anywhere, but I didn’t see too much in the way of spinning. When I noticed that the big chap could not get his speed over 10 mph it was clear the jig was up. This was riding on the flat. Ian was now a burst balloon, and hence he was advised to bow out at the Kirkhouse Inn. His tortured face seemed to show a bit of concealed delight. 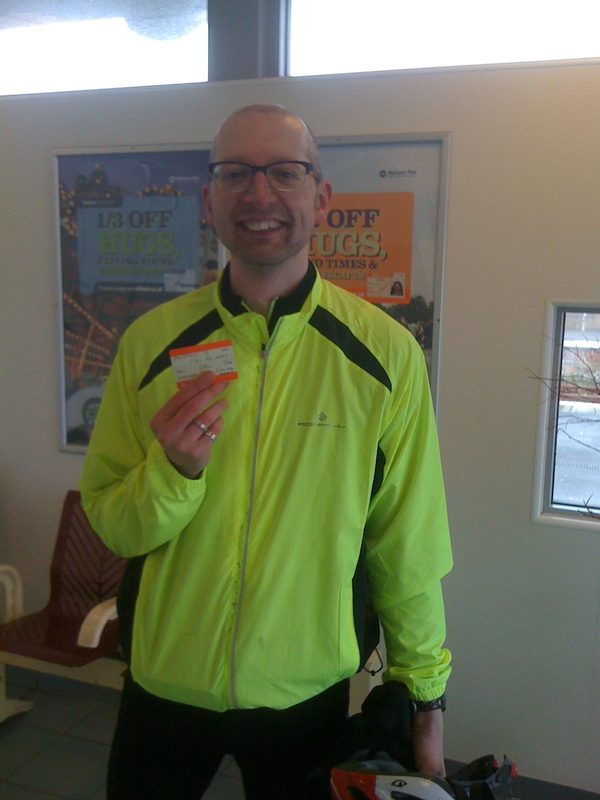 At the end of the day, he got a good 42 miles in the bag – no one can take that away and it’s all fuel for next time. Now we were down to 3 and me, Sam and Gio tore on towards Bishopbriggs in the gathering dark, getting a great little train going. Managed to get the 15.1 mph average up to 15.8 mph by journey’s end. A nice average of almost 19 mph for the last 13 miles. The last couple of miles saw myself and Sammy crest the final hill and cruise on home. The G man had run his race as his energy flagged for the final stretch. However, he got home fine with no mishaps (or if there were mishaps, we’re not telling. Let’s see if he’s got a slant on the last couple of miles). And so to curry, and the LEJOG meeting. Beginning to shape up – the trip and the bodies. Who’s up for next time? Ian? Post-cycle, curry and LEJOG meeting at Gio’s with most of the team present, with a few jobs assigned, flights booked and progress being made. Now if I could just translate my running pace to the bike and build up my endurance a bit more, I’ll be sorted.